If getting on the next flight to Zanzibar isn’t on the cards, why not give your tastebuds a cheeky holiday and put some heat into your cooking instead? When I was learning Spanish in Salamanca, lessons used to start enthusiastically early every morning – rather cruel I thought given the abundance of nightlife tempting us on every street corner! The first couple of lessons would wash by in a bit of blur until the mid-morning break when we would squeeze into the tiny tapas bar next door and order piles of patatas bravas washed down with strong coffee to tide us over until lunch. I’m not sure it did anything for my waistline but it’s a very happy memory indeed! These patatas bravas have got the fiery kick and smoky warmth of the traditional tapas dish but the potatoes are boiled instead of fried or roasted – as a midweek side dish, I wanted something quick and healthy without compromising on taste – a little Spanish flair in the heart of Highbury. Cook the cubed potatoes in boiling water until just cooked. While the potatoes are boiling, heat the olive oil in a frying pan on a medium heat. Add the garlic and fry for a minute or so (being careful not to brown it), then add the tinned tomatoes, tomato puree, smoked paprika, chili powder, vinegar, seasoning and a dash of water from the potatoes. Stir to combine and simmer for about 10 minutes to thicken. Stir in the potatoes, ensuring that they are entirely coated in sauce, and simmer for another 3 or 4 minutes until the sauce is thick and pulpy. 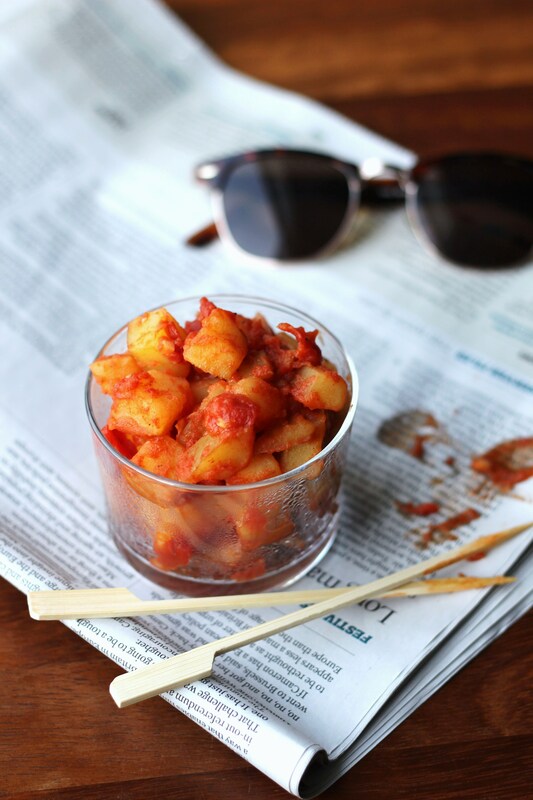 Tags: dairy free, easy, gluten-free, midweek, patatas bravas, potatoes, side dish, Spanish, tapas, vegan, vegetarian. Bookmark the permalink.